The new little iPad only got a few minutes of discussion at the event, and wasn’t demonstrated at all. 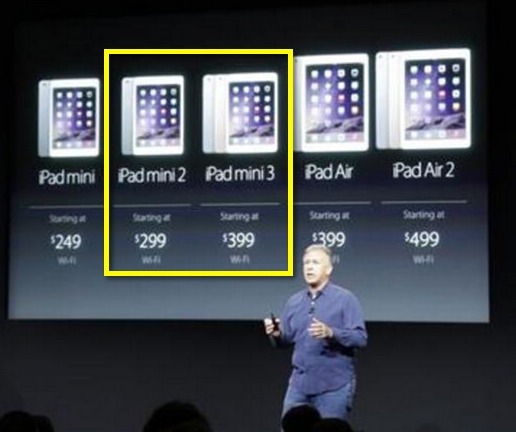 This was probably due to how little has changed from the iPad mini 2. Apple added Touch ID — the secure fingerprint reader —and a gold option. Everything else in the iPad mini 3 is exactly the same as the iPad mini 2. That new Touch ID sensor results in the iPad mini 3 starting at a cost of $399, which is $100 higher than the iPad mini 2. Adding the same Touch ID sensor that’s on the iPhone is a good feature, but not at that price. The lack of attention Apple is giving to the iPad mini seems like it’s stepping away from the small tablet form and going all in with the iPad Air 2 and iPhone 6 Plus. Perhaps management thinks that the big iPhone screen is infringing on iPad mini territory. Of course, Apple is unpredictable and may do something unexpected with the iPad mini. Given so little attention to the refresh of the iPad mini 3, the lack of stage time at the iPad press event, and the high price for such a little change, it seems the iPad mini has become a secondary product to the folks in Cupertino. I once thought the mini was the “real” iPad because I could carry it everywhere in a jacket pocket. But about two weeks ago I bought an iPhone 6 Plus, and I haven’t touched my mini since. (As punishment for my sin, I found 52 apps awaiting an update when I finally turned on the mini this morning…) Now I have an “iPad micro” in my (front) jeans pocket…and it makes phone calls. With the introduction of the iPhone 6 Plus, the iDevices playing field has changed: A broader range of iPhones could “chase” the iPad upward, creating opportunity for a beefier “iPad Pro.” Or perhaps Apple will use its now-proven microprocessor design muscle to make a lighter, nimbler MacBook Air. Whatever Apple does next, the iPhone 6 Plus might prove to be a turning point.